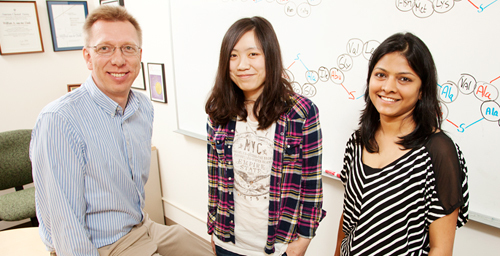 Illinois chemists - Wilfred van der Donk and graduate students Weixin Tang, left, and Neha Garg - discovered a molecule very similar to the antibiotic nisin, found naturally in milk and added to food for decades to fight pathogenic bacteria. The new molecule, geobacillin, is more stable than nisin, which could make it more effective. CHAMPAIGN, Ill. - Food-borne diseases might soon have another warrior to contend with, thanks to a new molecule discovered by chemists at the University of Illinois. The new antibiotic, an analog of the widely used food preservative nisin, also has potential to be a boon to the dairy industry as a treatment for bovine mastitis. The antibiotic nisin occurs naturally in milk, a product of bacteria resident in the cow's udder. It helps keep milk from spoiling and kills a broad spectrum of bacteria that cause food-borne illness, most notably listeria and clostridium. It was approved as a food additive in 1969, and since then has become prevalent in the food industry in more than 50 countries. "It's good to know that there are natural products added to our food that protect us from diseases," said lead researcher Wilfred van der Donk, a chemistry professor at the University of Illinois. "Many people probably don't even realize that, or think it's some kind of a non-natural chemical. Last summer we had the listeria outbreak, and that's a good example of people dying from pathogens in food. You don't hear of such outbreaks often, and that's in part because of the compounds that are added to food to kill the pathogens." Nisin also shows promise as a treatment for bovine mastitis, an infection in cows that costs the dairy industry billions each year since milk produced during and shortly after antibiotic treatment has to be thrown out. Since nisin already is present in low levels in milk, farmers using nisin to treat mastitis may not need to discard milk or meat from recently treated animals. However, for all its utility, nisin has drawbacks. It's produced in an acidic environment, but it becomes unstable at the neutral pH levels needed for many foods or pharmaceuticals. It also becomes unstable at higher temperatures, limiting its uses. While studying the genome of another bacterium that lives at high temperatures, van der Donk's group found genes to make a molecule with a similar structure and function to nisin, known as an analog. They isolated the genes and inserted them into E. coli so they could produce the new antibiotic, dubbed geobacillin, in large enough quantities to study its structure and function. "As it turns out, geobacillin is more stable, both in respect to pH and temperature," van der Donk said. "We think this is good news for potential use of geobacillin in food." Nisin, and presumably geobacillin, work by binding to a molecule the pathogen needs to build its cell wall and then poking holes in the bacterial cell's membrane, a one-two punch that quickly kills the invader. However, the two antibiotics have slight structural differences. Nisin's structure has five looped regions, formed by cross-links in the protein chain. Geobacillin has seven loops thanks to two additional cross-links, which give the protein added stability. The team tested geobacillin against several foodborne and disease-causing bacteria and found it similarly effective or more effective than nisin, depending on the bacteria. Most significantly, it was three times more active against the main contagious bacteria responsible for bovine mastitis. Contagious mastitis is devastating for dairy farmers, as the bacteria can quickly spread throughout a herd. In addition, since mastitis could be caused by a number of different infections, geobacillin's broad-spectrum activity makes it a very attractive treatment option. Next, the researchers plan to test geobacillin against a wider spectrum of disease-causing bacteria. Many tests of safety, efficacy and economic production lie ahead, although geobacillin has shown great promise in tests to date. The researchers hope that its greater stability will enable medicinal applications for geobacillin that nisin could not realize, both for bovine mastitis and possibly for human disease. "Nisin was very promising in early preclinical trials in that it was very effective in killing multi-drug-resistant bacteria in mouse models," said van der Donk, "but because of its instability, it has a very short half-life in blood. So we're looking to see whether geobacillin has greater serum stability." The researchers published their findings in the Proceedings of the National Academy of Science. The National Institutes of Health supported this work. Van der Donk is also a Howard Hughes Medical Investigator. Editor's note: To contact Wilfred van der Donk, call 217-244-5360; email vddonk@illinois.edu. U. of I. News Bureau or PNAS.